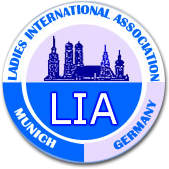 LIA Munich offers a place for women from around the world to join together and participate in social, cultural, linguistic and philanthropic activities. LIA is not a commercial club; we provide opportunities to form friendships, help each other to settle in and to gain a better understanding of German/Bavarian life and international culture. The General monthly meeting and other events provide an opportunity to meet as a large group, with interesting speakers and programmes. Regularly scheduled activities take place in a variety of venues allowing the possibility of meeting in smaller groups. All members must be conversant in English as it is LIA’s official language. LIA organises a General Meeting on the 4th Wednesday of the month at the Heide Volm in Planegg. Each month there is a speaker or programme except in August, November and December. If you wish to attend a General Meeting as a guest, please let us know by using the contact form. Membership is open to ladies of all nationalities. However, in order to keep the Club’s international character, our Constitution stipulates that no one nationality may exceed 25% of the total Association membership. Waiting lists are maintained for such situations and at present the German members’ quota has been filled. The annual membership fee is Euro 35.--.